Being subjected to a slip and fall accident can be a humiliating and injury inducing experience. Even when pain is felt, it’s more than likely that the victim will do their best to get up and continue about their day. Sometimes the incident is entirely our fault, we may not look where we’re going, or we may step incorrectly and find our foot sliding out from under us. While this may be a rare but real occurrence, sometimes the blame is not on the victim, but on the establishment. All of these and more provide the homey atmosphere for many of the Hispanic residents that call West Miami their home. Should you have suffered a slip and fall in any of these establishments, or any other public area in West Miami, then finding the best possible slip and fall personal injury attorney or lawyer in Miami is your next step. Wolfson Law Firm has been helping residents of West Miami and more in slip and fall accidents and personal injury cases since 1963. They can help in working through your injury and working towards trying to get you the compensation you deserve. All you need to do is call (305) 285-1115 for a free consultation. 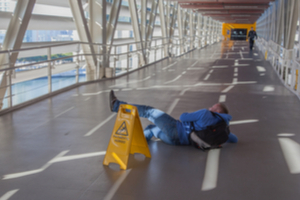 If you’ve been injured in a slip and fall accident in West Miami, then it’s possible that the responsibility of the accident does not lie on you, but on another person, or corporation. You should not have to suffer because of the negligence of other people. Spilled water, recently cleaned floors, badly leveled surfaces, these are but a few common causes for slip and fall accidents where the responsibility lay with the owner. The proprietor of the establishment makes a promise of reasonable safety for you and your family when you step on the premises. When this promise is broken by the actions, or even inaction of said owner then it is your responsibility to seek out the best possible slip and fall attorney in Miami. Wolfson Law Firm has been providing personal injury service for more than fifty years, and they have the ability to tell you if your case is one that can be litigated. Your time is valuable, and trust is important. Pursuing a case that has no value to you and will only end up causing you to lose money because of legal fees and court costs is something we know you don’t want. Our personal injury legal team will review your case quickly and efficiently and inform you if your case is worth pursuing. Our West Miami slip and fall attorneys at the Wolfson Law Firm build the case before coming to negotiate with the defendant and their insurance company. Once all the required evidence is collected that verifies your injuries were caused by the negligence or inattention on part of the owner, we begin negotiation and send a settlement request to the insurance company. Should they accept then we can already see a quick resolution to your case. If they refuse or take too long in responding, or don’t respond at all, we go ahead with filing a lawsuit, and when needed, go to trial to fight for you. The Wolfson Law Firm’s legal team is more than happy to help when it comes to these situations. Mr. Jonah Wolfson is the managing attorney for the company and is a bilingual personal injury and wrongful death attorney in Miami-Dade. He is available to meet at his offices in Ft. Lauderdale, West Palm Beach, Miami, and Fort Myers, or via phone at (305) 285-1115. He and his legal team can also come meet you if needed, don’t hesitate to call, that way we can do our best in helping you.